Finished a 20mm AB Red Devils commission, wow these are nice figs, even better than the excellent AB Fallschirmjager set, I have these in my own stash, looking forward to doing them again at some point. Last edited by Gunner Dunbar on Sat Feb 25, 2017 11:48 am, edited 11 times in total. How fast are you pumping these out? If I could afford to get some commissions done I would probably send some your way. Just finished this batch of 30 20mm Russian WWII troops, the sun is pretty strong here today, so the pics are a bit washed out. 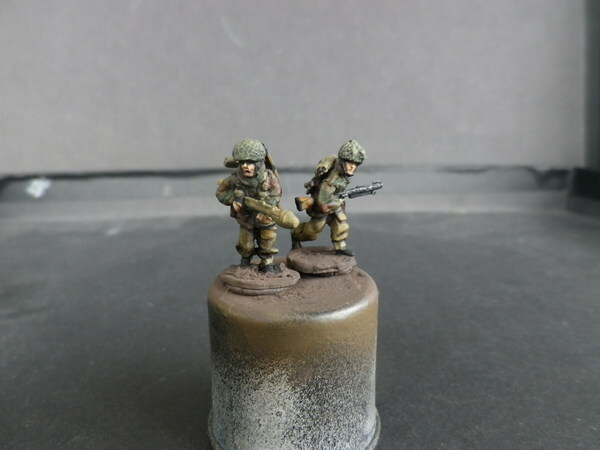 Finished up some 20mm Early war figures on commission, all comments welcome. Just finished up this largish 20mm British Airborne force, figs are mostly FAA with some ABs, most of the jeep riders are AB, the FAA figs are nice (I have some of their Romanians) but they are a step behind the superb ABs, 4 of the jeeps are the new Airfix airborne jeeps, which I made up and added stowage to, the others are metal (not sure who makes them) the airfix jeeps are excellent, though they could have added more stowage in the set, as this was common on the real jeeps. 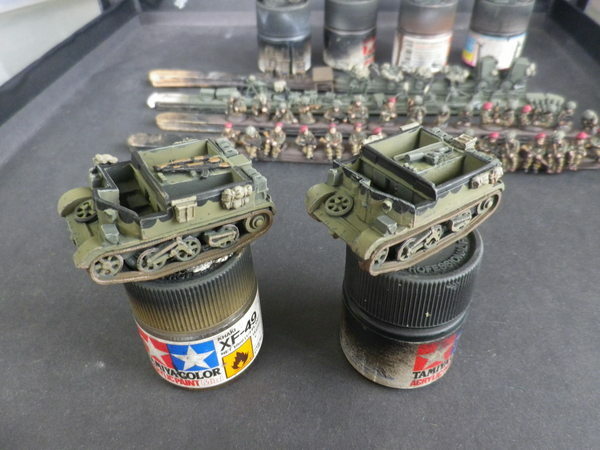 I cut most of mine from old plastic Italeri British infantry and added some resin boxes. The guns can be removed from their bases, all in all pretty happy with how this force turned out, all C&C welcome. Another 20mm British Para batch, next up on the table, a 15mm Brit para batch. Finished this batch of 20mm AB SS figures in Spring Oakleaf an blurred edge, as usual beautiful figures, all comments welcome. 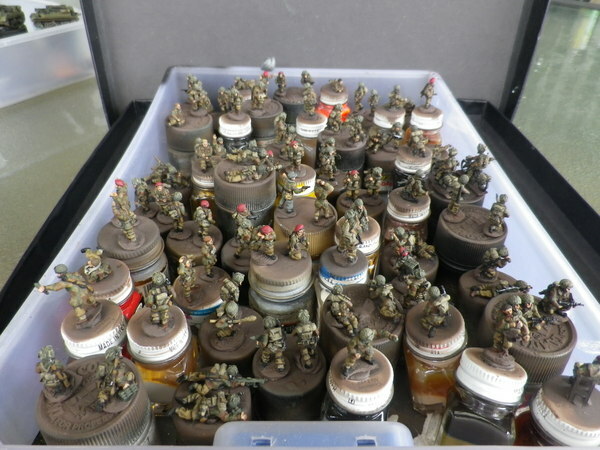 Have put this platoon plus sized force of late war Germans together out of my stash, they are a bit of a mix of AB, TQD, CP, PSC and some other plastics, there are 3 x 10 man sections, a 5 man HMG, a mortar team, a couple of sniper, and panzershrek teams, an FO team and a mix of HQ types, pretty happy with how they turned out, all comments welcome. Sorry late reply but wow mate. They are supreme. Wish they were sitting here in front of me live. Greta post and thanks for making my week. Wow, making your week? Must have been a slow week, Thanks. Better read what I type next time. Actually was a slow week but not what I was supposed to mean. Thanks for picking that up. What denomination of coins are you basing these on Gunner? 5c for the singles and 10c for the doubles. Finished these on commission for a long time customer, he unexpectedly sent me a parcel of yummy chocolates from Canada recently, so I decided to return the favour by gifting him this JS-1 to go along with his infantry, I built it many years ago, I believe it was an Italeri kit, I detailed a couple of areas with wire, all comments welcome. 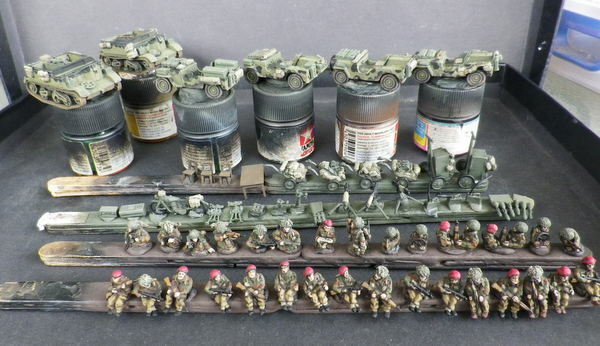 This is the organising part of a 1/72 WWII winter US group, figures used are TQD (metal), Italeri US winter (sand), Italeri US (green), PSC US heavy weapons (grey), a couple of Italeri US Paras and a couple of Italeri Brits. I have done some basic pose and head conversions to minimise the same poses, I will further modify them by winterising the none winter troops. Also making a 5 man bailed tank crew, just for the fun of it. The TQD figures are a little larger than the plastics, however not overly so, and they all mix together pretty well, and I will be bulking the plastics out a bit when I winterise them. Should get these on the painting desk in a week or so, all comments welcome. This 1/72nd Winter US group is nearly ready for painting, I have tried to keep copies of poses to a minimum, have added 2 x 6 man ATG crews, these were made up of a mix of PSC US heavy weapons and Russian ATG crews, this force has quite a mix of figures, US infantry and paras, Brits, and Russians, but they will all look like Yanks once painted. All comments welcome. Winter US finished, most of the greatcoat figs are TQD metals, lovely, but large, the plastics are all converted, and are a mix of a couple of Italeri sets (winter and summer uniforms) PSC US heavy weapons and some PSC Russian anti tank gunners, I think this force turned out nice and will see if some pics of this force can be posted once based. All comments welcome.